Wax for exterior wood, plastic and rubber parts. For wood and plastic body components, sidewall of tyres and rubber seals. Outstanding colour restoration with silk-matt gloss for faded exterior wood and plastic parts. Long life care and protection against embrittlement and weathering, water and dirt repellent. Free from AOX and silicone. Thoroughly pre-clean with cold detergent. Apply polish evenly with sponge or cloth. For very faded parts we recommend using coarse sponge. The gloss finish can be further enhanced by polishing up the surface. Protect from frost. We recommend to treat the trailer in a half-yearly cycle with professional care for trailers. 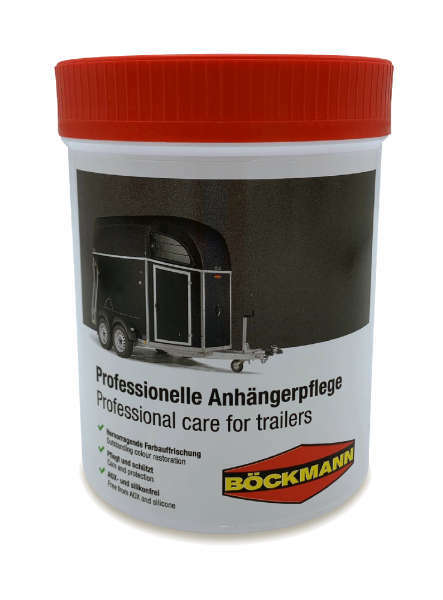 Böckmann-Clean - Special polish for fibreglass horse trailer! It polishes rough surfaces caused by environmental influences and ensures a brilliant gloss finish for matt paint. Insects, tar and stubborn dirt can be removed easily. Contains silicone. Wash the trailer with basic cleaner. 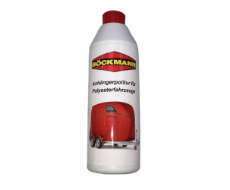 Then apply Böckmann-Clean evenly to the dry surface with a polishing cloth by rotary movements. Go ahead in sections. When using a polishing machine, take a suitable polishing wheel. Polish dried on the paint can still be used if moistened with water. Protect from frost. 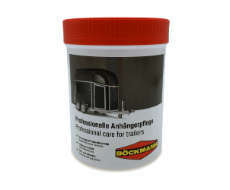 These care products can be ordered by each Böckmann selling partner.